One day Ella, our eight-year-old granddaughter, was visiting us. She pulled out a biography of Laura Bush, whom she had been reading about over the last few weeks of school. She shared all the facts she could remember with enthusiasm and answered several questions. I told her about a time several years ago when I donned a wig and a pantsuit to dress as Mrs. Bush and joined my friend John Morgan at an event. John is a George W. Bush impersonator. John and his wife Kathy are among our closest friends. Kathy used to impersonate Laura Bush and stand next to her husband during his gigs. This was an extreme act of love for Kathy, who prefers to be more behind the scenes. One day, Kathy couldn’t (or maybe wouldn’t) help her husband out, so she brought me the wig and talked me into standing in for her. I guess that made me a Laura Bush impersonator impersonator. I have to say – I know how Kathy feels! I am glad for that once-in-a-lifetime experience but am happy to keep it as just that. This story, along with what she was reading, made an impression on Ella; because when her third grade class prepared to put on a Wax Museum, she already knew who she wanted to be. That’s right, Madame Curie. Just kidding! 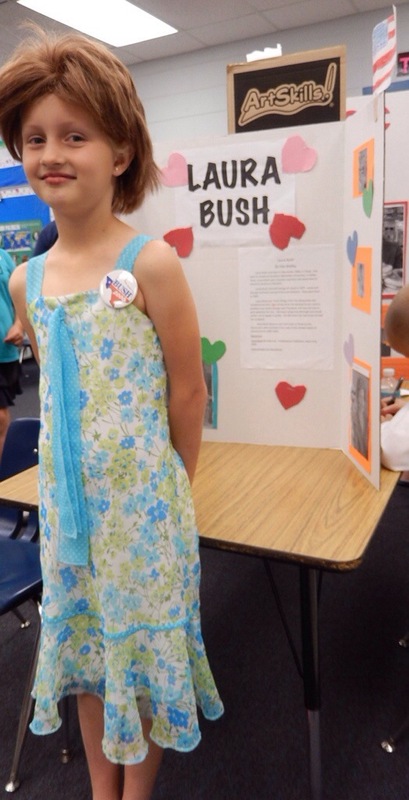 She was very excited to gather her costume and become Laura Bush. Our wonderful friends lent her the Laura Bush wig, so she was good to go. Ella was also committed to helping her friends with their costumes. One friend was going to be a queen, and she didn’t have a robe; so Ella borrowed an old kids’ robe from our house for her. I struggled to see how Mary, Queen of Scots, was going to look regal in a faded blue bathrobe; but that was a problem for someone else. The day of the Wax Museum arrived and the children were in position. You would stop in front of each student and they would recite a small biography of the person they were dressed as. A tri-fold board was behind them with more information on their subject. Ella nailed her recitation. As I checked out the museum, I was happy to see that Mary, Queen of Scots, was not wearing a bathrobe. That had been passed on to Muhammad Ali, who wore it well, along with a pair of boxing gloves. I was also relieved that Mary was far from Queen Elizabeth I. If you remember your history, you know that could have gotten ugly! Love the Ella stories! Actually, I think Robert met your friend, the Bush impersonator, when he did a John Maxwell seminar in 2011… How cool – it really IS a small world.